Come and stay at this stunning holiday home opposite the beach. The photo's of this property really say it all. You will not be disappointed. Great for families or the executives for a office getaway.Grab some friends and make the most of its facilities, size and position!! Doesn't get any better really in Busselton - This one really does have it all. Sorry no Leavers. Five kilometre walk along cycleway to the Busselton Jetty and the hub of Busselton. Stop with the kids at Yoganup Park for a play before having a leisurely breakfast at the Goose or Equinox restuarants. Take a train trip on the Jetty and then walk into the buzzing centre of Busselton. I have been operating the property as a Holiday Home for 7 years now. I work selling Real Estate in Busselton and love working with people. My aim is to make your stay as enjoyable as possible. I have been living in Busselton since 1979. If you are looking at coming to Busselton for a family holiday let me know and I can suggest all sorts of activities you could look do. Home is opposite the beach and will take you a couple of minutes to dip those toes in the water. Wake up every morning with the ocean washing your senses. Has plenty of separate areas for the family and plenty of secure fencing for that furry friend to enjoy themselves as well. For those that don't like the sand between their toes, enjoy the pool. Beautiful views from the balcony to the Busselton Jetty and the Cape. On a clear night you can see the lights of Bunbury and with binoculars you can see the cars driving. Ceiling fans only. Plenty of doors, windows and double insulated. Large lawned backyard fully enclosed. Staying at the beach shack was an absolute pleasure. The house had everything you could possibly need with uninterrupted views of the bay. We watched dolphins swimming by while we had our breakfast on the balcony. Plenty of room for large groups without feeling crowded. Owner Bridgette was really helpful and made our stay stress free. A great family holiday home! We thoroughly enjoyed our stay at The Beach Shack! The house was very clean and comfortable and in a great location. Bridgette was very accommodating to our family’s needs. It was so nice for us all to be under the same roof. We will definitely be recommending The Beach Shack to others and would love to stay again in the future. We had a lovely getaway at the beach shack. 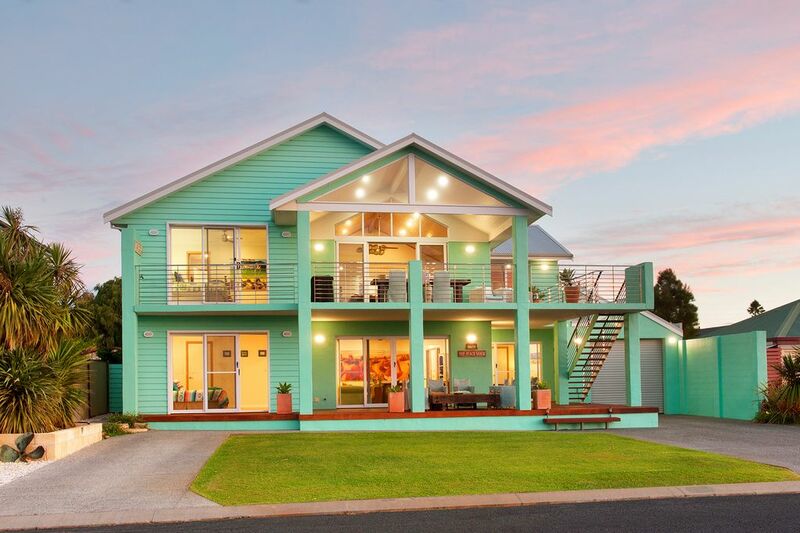 It’s a large well appointed house with multiple living spaces in which to enjoy the Busselton weather and beach views. I would highly recommend this house. Views were amazing, quiet home away from home. Very relaxing, very clean, perfect family home. Excellent communication with the owner. Will definitely stay again. Emma I would have to rate you all as some of the best guests I've ever had. Thank you so so much for leaving the property so tidy. Makes all the difference. You are most welcome to stay again at any time. I'm so glad you and your family had such a lovely time. Wonderful for a large family vacation! We came from the USA with three generations of family ranging in age from 85 to 25 - all ten of us - for the week before my son’s wedding. This home was perfect! The home has all the conveniences, great bed and bath arrangements, and lots of comfortable open living areas. We really enjoyed the second floor balcony with spectacular views over the bay. We never felt crowded. Cooking was easy in the well equipped and modern kitchen. Bridgette was easy to communicate with and very responsive to the few questions we had. There are so many things to do in the Busselton area - we got bikes and stand-up paddle boards, we did a full day tour of wineries, went to caves, rock pools, the lighthouse, breweries, the jetty - something for everyone! The drive down from Perth was easy and not far. Stopped in Bunbury for lunch on the waterfront. Wow - hope we make it back to WA again. Thanks for your comments Keven. I am so pleased it catered for your whole family easily and that there was room for everyone to have their own space. Yes we have a lot of enjoyable things to do and see in the area. We are very lucky. I hope you see you visit us again with your family. Your shawl is on its way. Couldn't locate any ties though sorry to say. Best wishes for a lovely Christmas in the USA.